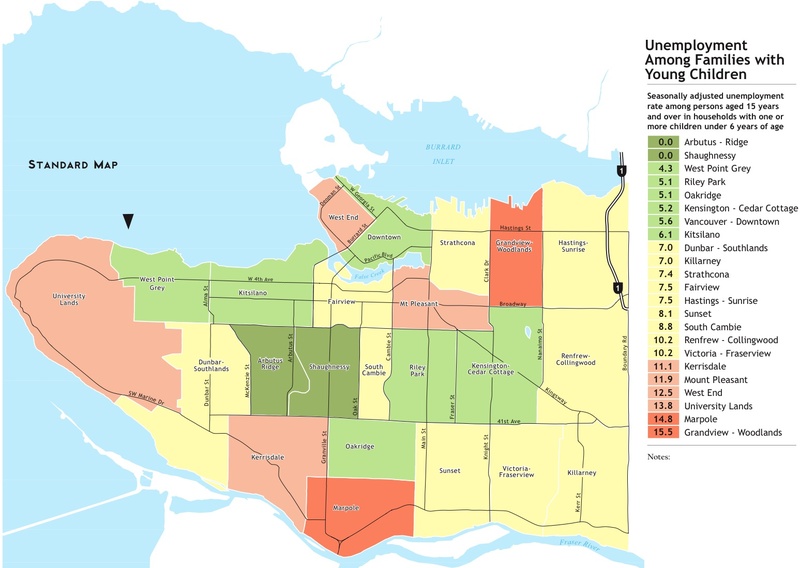 The socio-economic data for Vancouver, complied by Human Early Learning Partnership at UBC, shows some pretty striking things about the nature of the areas around Dunbar and UBC. The maps are worth reading just to see how starkly particular areas stand out as different then the rest of the city in terms of median and average household income, percentage of households living at or near the poverty line, stability in housing, multi-generational occupation of same house or neighbourhod, language spoken in the home, ethnicity, and a variety of other socio-economic indicators. It really is a situation were the pictures speak for themselves. Have a look at the full report on the early learning web page. See, also,previous posts on comparative demographic data and UBC/UEl population data. There is an urgent need for Seismic upgrading and this issue MUST be separated from the issue of school capacity. The Ministry’s refusal to release funds for seismic work is verging on criminal. The EFR data is misleading regarding the costs of Annexes. We share the catchment for French Immersion with Jules Quesnel, so why do we not share Queen Elizabeth’s English catchment as we are an Annex to that main school. The VSB’s new slide, a scattergram showing in and out of catchment QEA students is misleading. The inevitable densification of our neighbourhoods and the resulting increase in the school age population. Selling prime property for a lease is a bad idea. Once the land is sold, it is unlikely that the VSB would ever be able to purchase in this neighbourhood again. And many more, but we don’t want this email to be too long…..
1. Please register to make a presentation to the trustees, please do this by close of business today although the official deadline to register is February 10 at midnight.